On my most recent Family Girls Weekend Getaway (last weekend) I heard God talking to me the very first morning. It was just in my waking moments on the first day. I had not even gotten to our "official hotel" yet. A group of about 10 of us were at a hotel near the airport since my flight got in kind of late the night before. I was sleeping on a fold out couch of the Homewood Suites by myself when I distinctly heard "The Best is Yet to Come". On these weekends I begin with a certain degree of worry ~ will everyone arrive safely (all 36 of them in this case), will ever get along (they are related remember? ), will everyone have fun, will all the hours I put into planning come to life as I had dreamt? On this specific morning I was thinking okay if 10 of us are here already then at least 1/3 of the ladies are in place. Anyway, I HEARD "The Best is Yet to Come" over and over. It was repeated at least 3-4 times. Almost as if it was being spoken right into my ear. I have always felt God on my side when doing these trips because so many blessings have poured my way during these trips. I have seen mini-miracles right before my eyes. That is my thank you gift from God. Each year the trips get better and better - HOW could the BEST be YET to COME??? At the Go Red For Women dinner we had the first night I told the girls about my God words. 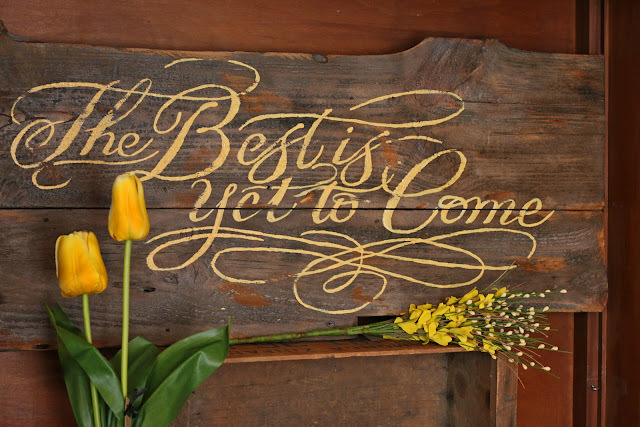 And we were in agreement that "The Best is TRULY Yet to Come". In town the following day I stumbled across a wooden plaque engraved with these very words. So, naturally I had to purchase it. I can't wait to hang it in my home as a reminder that "The Best is Yet to Come". I will write soon about our fabulously amazing trip to Hotel Fauchere in Milford, PA. The next trip that promises to be better than this past one as if that is even possible will be in the fall of 2013 to Moose Hollow Lodge in Pigeon Forge, Tenn. We will do a day at Dollywood and even a Dolly Night complete with Karaoke!